Home » computers , gog.com , lucasarts , star wars , tie fighter , video games , x-wing » GOG.com has released X-WING and TIE FIGHTER! GOG.com has released X-WING and TIE FIGHTER! Courtesy of the amazing folks at GOG.com (the GOG stands for Good Old Games), what are by far two of the greatest computer/video games ever wrought by mortal hands have gone on sale today, ready to be enjoyed by a new generation or by those who have longed to reminisce about those heady days of the early Nineties. And I would be saying that even if they weren't Star Wars titles! X-Wing was an astounding and revolutionary game in its own right and when it came out early in 1993 it took the industry by storm. With a brilliant combination of 3D graphics, rich user interface, an immersive storyline and balanced yet incredibly challenging gameplay, X-Wing was the Star Wars experience that everyone wanted but few thought we would ever get. This was the combat simulator of its time and even by today's standards it holds up incredibly well. At last, players could join the ranks of the Rebel Alliance in the fight against tyranny, with a variety of fighters: the X-wing, Y-wing, the ever-slippery A-wing and the powerhouse B-wing. 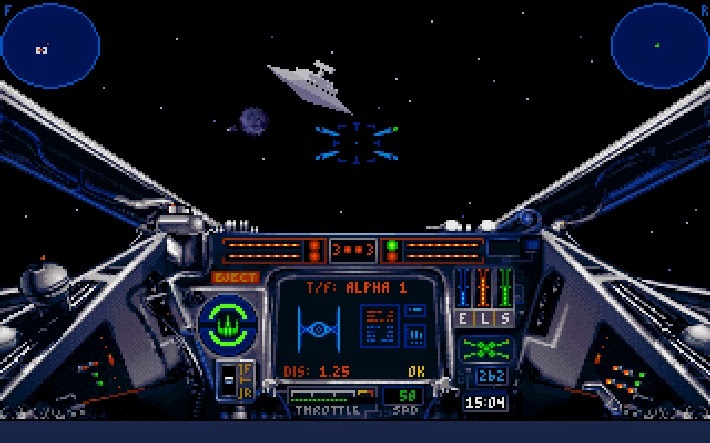 But not to rest on its laurels, the following year LucasArts released TIE Fighter: still considered by some to be THE best computer game of all time. TIE Fighter turned the tables and let gamers take to the skies against the scum and outlaws that the Rebels really are (the intro sequence alone are enough to make one giddy about blowing Rebel fighters out of the stars). TIE Fighter improved on everything that made X-Wing work, and then some. An even more interactive story/campaign and array of craft (including the TIE Defender and my personal favorite the TIE Bomber) gave you all the tools you'd ever need to show them pesky Rebels what's what. And as of today GOG has made X-Wing and TIE Fighter available and 100% compatible with modern systems! If you're still playing these classics with old CD-ROMs (or even the original floppies), you'll never again have to juggle disks. For $9.99 each you can download a DRM-free single-file installer and set up either game (or both) on any moderately-equipped system from Windows XP on up. Incidentally, for the ten bucks you're actually getting two flavors of each game: the original DOS version and the "Collector's Edition" that ran on Windows and required a joystick (the DOS games could be played with a mouse). The Windows-based Collector's versions have prettier graphics. But the DOS ones have the iMuse MIDI score that changes dynamically as events in the game are triggered (i.e. the Imperial theme starting up as a Star Destroyer suddenly arrives on the scene). The Windows editions have Redbook WAV audio instead (meaning it doesn't change per combat conditions). Personally, I'm going with the DOS versions at least at first. Having an iMuse score with the game itself more than justifies the price tag. So what are we waiting for? Mash down here for X-Wing and aim here for TIE Fighter! So there it is: X-Wing and TIE Fighter for modern computers at long last. Go get one. Or the other. Or get both. Now. You know you wanna. You're flying A Wing and you see that star destroyer? The one blasting all its turbo lasers at you? Now go fly past it real close and examine it. Oh and the one where you have to keep the shuttle from being captured while being pounded by too many TIEs. Games today are too easy. X Wing and TIE Fighter were is now and forever will be the pinnacle of what video games should be! I remember that one! I think it was still pretty early in the game too. There was another mission that I'm also thinking of: the one where you have to destroy the 3 freighters. But if you're too slow the freighters jump to lightspeed and your mission is a scrub. Even *one* freighter escaping was enough to get the mission failed message. There was a mission in TIE Fighter where you're flying a bomber that was *seriously* tough. I think it took me 2 days to get past that one. It was neat that you could choose the missile/warhead loadout on your ships in that game. Well, I tried *every* combination I could think of to take the station out from as far way as I could. But nope. You *had* to get in close or else enemy fire would just target your warheads while they were still so far out. Those games were *punishing*. Don't even get me started on fighting the TIE Advanceds, LOL! Unless you were flying the A-wing it was enough to drive you crazy. "You aren't a true man until the Emperor puts all his tattoos on your arm." Ahhh yes. Who can forget: winning a mission but going back to replay it over and over and over again trying not only to beat the mission but fulfill the secret mission objectives too. 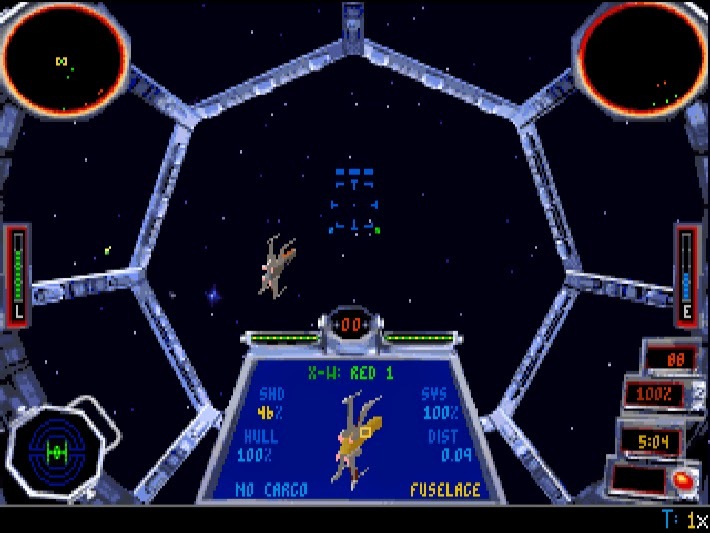 No wonder why two decades later TIE Fighter still has such amazing replay value. So yesterday despite everything that I said I wouldn't do, I succumbed to the temptation and broke down and purchased X-Wing and TIE Fighter both.